Weekend is written as ONE word. AT or ON the weekend? I play football ___ the weekend. Do we say AT the weekend or ON the weekend? Both prepositions can be used in this sentence. It depends on where you are speaking or using English. Note: We do NOT say in the weekend. I think I’ll visit my parents at the weekend. I read an entire book on the weekend. I’m going to set aside an hour at the weekend to clean the bathroom. On Fridays after work or school, you may hear people say “Finally, it’s the weekend!” even though it is not Saturday yet. We do not use prepositions before LAST or NEXT. I think I’ll go to the beach next weekend. Here we are specifying that it was the weekend that just went by or the weekend that is coming up. Both last and next can be replaced by at the/on the and retain the same meaning. We also do not use prepositions before each, every, this, that + weekend. We don’t say all the weekends, we say every weekend. I’m very active. I play football every weekend. When I was lived in Australia, I went to the beach every weekend. Or it can refer to something that happens at a single point but at some time within the duration of the weekend. It is not necessarily on both days. She said she would call me over the weekend. I’ll fix it over the weekend. = At some point during the course of the weekend. A long weekend is a weekend that has at least three days due to a public holiday falling on either the Friday or Monday. Friday is a public holiday so the Friday, Saturday and Sunday is a long weekend. Weekend is mostly used in singular form. 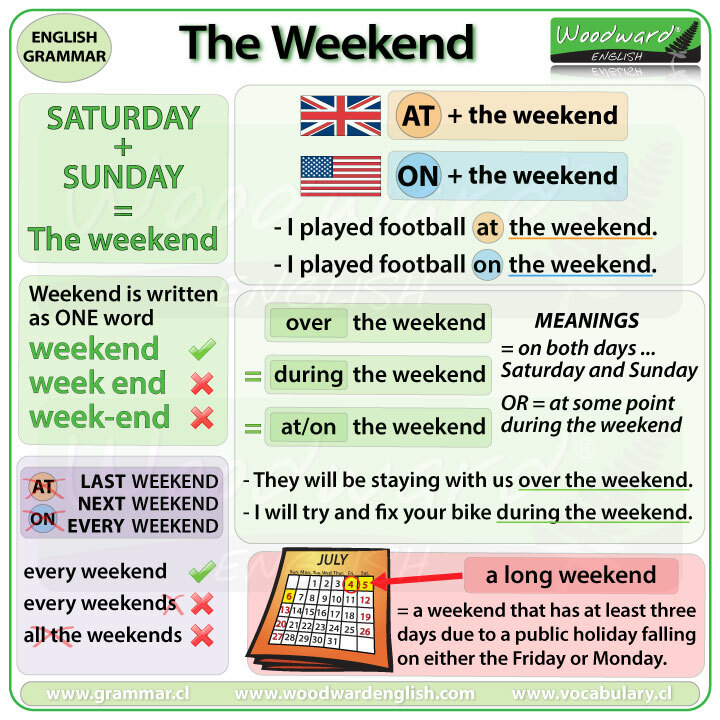 However it can be used in its plural form (weekends) when we are referring to a number of different weekends over a period of time. One final thing, we don’t write weekend with a hyphen in the middle. What do you normally do on the weekend?